Aside from platinum, precious metals futures advanced Thursday. 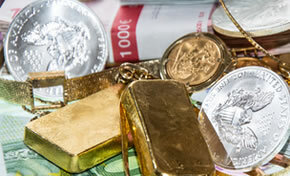 Gold, silver and palladium extended their winning streaks to three in a row. Gold and silver also finished at new multi-month highs. Gold for February delivery tacked on $8.10, or 0.6%, to settle at $1,281.10 an ounce on the Comex division of the New York Mercantile Exchange. The settlement was the best since June 14 when gold ended at $1,308.30 an ounce. "Gold prices are trading toward their six-month high as investors factor in all the risk despite the fact that we have seen a stellar rally in the equity markets yesterday," MarketWatch quoted Naeem Aslam, chief market analyst with Think Markets UK. Gold futures ranged from a low of $1,269.10 to a high of $1,281.60. They edged up less than 0.1% on Wednesday and they rose 1.1% on Monday. Meanwhile, silver for March delivery added 18.7 cents, or 1.2%, to settle at $15.31 an ounce. The settlement was the highest since silver ended at $15.462 an ounce on Aug. 9. Silver futures traded between $15 and $15.34. They surged 2% on Wednesday and they gained 0.8% on Monday. April platinum declined $3.50, or 0.4%, to $801.40 an ounce, ranging from $790.10 to $807.10. Palladium for March delivery advanced $8.60, or 0.7%, to $1,194.50 an ounce, trading between $1,181.50 and $1,198. A week ago Wednesday, Dec. 19, palladium ended at a record of $1,201.30 an ounce. Gold rose $6.75, or 0.5%, to $1,268 an ounce. Silver jumped 38 cents, or 2.6%, to $15.055 an ounce.